Four generations of Worths are associated with perhaps the most enduring name in fashion history. Indeed, without the house's contributions to fashion, the French Second Empire would not be remembered as an unending parade of luxurious confections in women's dress, and the Gilded Age would not seem so golden. Charles Frederick Worth (1825-1895) was the founder of a fashion house usually credited with establishing the highest level of fashion creativity: haute couture. Originally the French phrase meant the highest level of sewing. Later it was employed to identify that portion of fashion-particularly French fashion-that both exemplified the pinnacle of dressmaking techniques and produced new styles. Unfortunately, the phrase haute couture has lost its original meaning through overuse. Charles Frederick Worth was uncommonly astute in recognizing that his talents were better directed toward artistic creativity rather than managing a business. Following a period of working in London dry-goods shops, Worth set out for Paris. In 1846 he found a position at the prominent dry-goods and dressmaking firm of Gagelin et Opigez. This position gave Worth the experience that later enabled him to build his own business. At Gagelin he was exposed to the best resources for fabrics and trims, and allowed to develop his design skills. He also learned the value of live models and met his future business partner, a Swede named Otto Bobergh (1821-1881). What eventually became the House of Worth was established in late 1856 or early 1857 as Worth and Bobergh at 7, rue de la Paix, with Worth as the artistic head and Bobergh as the financial director. The partnership dissolved in 1870-1871, when Bobergh decided to retire due to major political unrest in France. Worth's wife, née Marie Vernet (1825-1898), was a former Gagelin model. Mme. Worth easily attracted the attention of the ladies of the French court and then the Empress Eugénie herself, by wearing Worth's creations. Taken with promoting French industries, including the once-dying silk industry of Lyon, the empress thrived on lavish gatherings and equally lavish dress at these events. The empress appointed Worth the court couturier in 1860. To make sure his house could keep up with the growing demand for his dresses, Worth introduced a new way of creating an outfit. Instead of designing a complete dress, he pioneered the concept of mixing and matching skirts and bodices, which insured that ladies did not appear at a function in look-alike attire. Worth also developed inter-changeable pattern pieces in constructing these garments, further insuring the uniqueness of a completed ensemble. At the House, clients could preview evening attire in rooms illuminated by various forms of light-natural light, candlelight, gas lamps, and later, electric bulbs. While the House maintained the usual fitting and modeling rooms, it also offered rooms for fabric selection that were distinguished by color. An understanding of the play of colors and textures was one of the enduring achievements of the House, and was successfully passed from generation to generation. Charles Worth's sense of color was particularly noteworthy-he preferred nuanced hues to bold primary colors. Throughout the House of Worth's existence, it catered to the rich and titled, although it also served those of more limited means. Garments could be ordered from afar with no personal fittings required. The client supplied a comfortably fitted garment from which appropriate measurements were taken. Worth's models also could be made from commercial paper patterns. The House initially advertised its creations in obscure but aesthetically interesting nineteenth-century publications before entering the mainstream at the end of the century with full-page images in Harper's Bazaar and The Queen as well as their French counterpart La mode illustrée. In the twentieth century, the House's models were advertised in such selective fashion publications as the Gazette du bon ton, and such newer entries as Vogue. The former type of publication carried on the centuries-old tradition of hand-drawn and hand-colored illustrations, while the latter featured modern photographs. 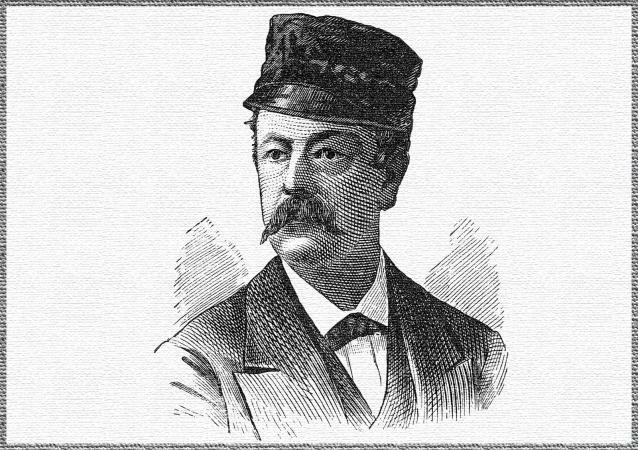 Late-nineteenth-century publicity images of Charles Frederick Worth depict a man who saw himself as an artist, wearing a bow at the neck or a beret. Many of the images of his son Jean-Philippe also show someone intent on conveying an impression of creativity. Like many classically trained painters and sculptors of their day, the Worths drew on historical prototypes. The House's designs included references to garments in historical paintings gleaned from museum visits, published descriptions of works of art, and personal familiarity with historic costume. Large numbers of Worth garments from the period of Charles and Jean-Philippe referenced seventeenth-and eighteenth-century styles, but none of them will ever be confused with their prototypes, thanks to construction detail and fabric choice. The Worths employed several distinguishing features in their garments beyond the waistband label that they first introduced in the mid-1860s. Although often credited with the innovation, Worth was not the first dressmaker to use a label. The earliest Worth examples were stamped in gold, but they became a woven signature in the late 1870s. This signature label would last the duration of the House. Attempts to defraud the public with spurious labels were made, especially in the United States in the early twentieth century. Contrary to Worth family mythology, the vast majority of the House's garments were trimmed with machine-made rather than handmade lace. Many Worth clients had collections of lace that had been acquired as investments. Sometimes such lace was used on a garment but almost always removed later and returned to the client. 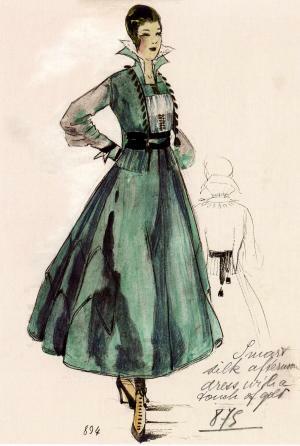 The same procedure was followed if gemstones were incorporated into a garment's design. An additional feature employed by the House was the use of selvage as a decorative touch as well as functional finishing. Perhaps the House's most important contribution was the type of fabrics that it employed. Following the collapse of the Second Empire in 1870, Worth became an even more important client for the textile and trim producers of Lyon and its environs. There is evidence that Worth both used preexisting yard goods and worked with manufacturers to come up with patterns for new materials. Charles Worth had begun his designing career by following the expansion of women's skirts in the 1850s, when they were supported by layer upon layer of petticoats. In the later 1850s Worth draped yards of fabric over the skirts' increasing width, as the newly devised crinoline cage, or hoop, permitted expansion without increased bulk. Many Worth dresses from this period, sadly, were frothy, cloudlike confections in silk tulle that have now melted into oblivion. 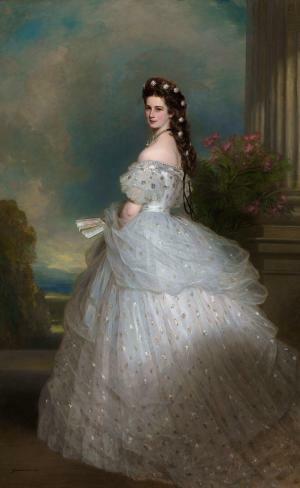 An impression of their impact, however, can be seen in portraits by such artists as Franz Xaver Winterhalter. Worth introduced hooped dresses with flatter fronts in the early 1860s. It is evident, however, that he was careful not to diminish the amount of material needed; he merely pushed the fabric to the back of the dress. During this decade Worth is also credited with developing the princess-cut dress. These less expansive styles posed an economic challenge. Having been trained in dry-goods shops, Worth recognized the danger of weakening trades that contributed to the success of his own business. Therefore he had to either incorporate large quantities of material into his garments or support the production of costlier luxury goods. In order to maintain a high level of consumption, the House moved material throughout much of the 1870s and 1880s from draped overskirts to trains, bustled backs, and a variety of combinations of these styles. Just as the Empress Eugénie's patronage of the French textile industries had been crucial before 1870, so also was Worth's business vital for the looms of Lyon and Paris that created spectacular luxury materials afterward. Many of the House's early garments had been constructed of unpatterned silks-tulles, taffetas, reps, and satins-or nominally patterned fabrics featuring stripes and small floral sprays-in other words, typical dress goods. Beginning in the 1870s, almost as a move to fill the void left by the departed French court, the house increasingly employed more expensive textiles usually associated with household furnishing in its garments. Worth boldly utilized grand-scale floral motifs designed for wall coverings in garments whose skirts were often not long enough to include a full repeat of the pattern. Such luxury fabrics, exhibiting astonishing richness of material and the highest level of technical skill, were a feature of the House's models into the first years of the twentieth century. With the exception of machine-made laces, Worth's trims and embroideries matched the ground fabric to which they were applied. The consensus among Worth's clients was that these costly toilettes were worth the price. Charles Worth and his house did not merely purchase materials; they are also known to have worked closely with textile manufacturers. From such concerns as A. Gourd et Cie, J. Bachelard et Cie, and Tassinari et Chatel, the Worths either commissioned specific designs or ordered preexisting patterns. Often the fabrics they chose had been displayed at important international exhibitions. Many of the fabrics found in late-nineteenth-or early-twentieth-century Worth garments feature subjects that were especially popular with the House: feathers, stalks of grain, stars, butterflies, carnations, iris, tulips, chestnut and oak leaves, scallops and scales, and bowers of roses. Worth was not the first man to be an acclaimed creator of fashion. LeRoy had been held in similar esteem as a milliner and dressmaker to the Empress Josephine. Worth was, however, the first clothing designer to be called a couturier. Nevertheless, Worth had the good fortune to be a man entering a field that had become dominated by women, a position that automatically made him a curiosity in the 1850s. During the heady days of the Second Empire, the magic of the "man milliner" called Worth drew the fashion-conscious to the rue de la Paix. Worth's clients were decried as slaves to this dictatorial monarch. Nor was it lost on the House that the theater was an active agent for the propagation of fashion. Even when dressing actresses of the stature of Sarah Bernhardt, however, Worth would insist on full payment for garments. 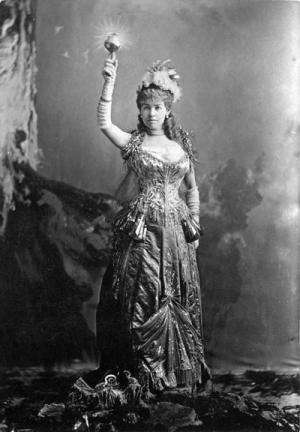 British actress Lillie Langtry was a faithful client, as were such other grandes horizontales (courtesans), actresses, and opera stars as Cora Pearl, Eleanora Duse, and Nellie Melba. Such Bostonians as Lillie Moulton, Isabella Stewart Gardner, and Mrs. J. P. Morgan were dressed by the House, as were their counterparts of the Vanderbilt, Astor, Hewitt, Palmer, McCormick, and Stanford families in New York, Chicago, and San Francisco. The House dressed members of the royal families of Russia, Italy, Spain, and Portugal as well as the noblewomen of numerous German principalities. The first challenge to the house's primacy came with the founding of the House of Paquin in 1891. During the 1890s Worth began to lose clients to this concern. An analysis of the order numbers found in late nineteenth-and early twentieth-century garments reveals not only the year of manufacture but also the fact that orders were declining during this period. But for nearly fifty years, however, a Worth garment had been the most coveted of all apparel, particularly among American women. Perhaps this popularity developed because women from the United States felt at ease discussing their dressmaking needs with a man who could speak English. In return, Charles Worth appreciated his American clients because they had faith in him, figures that displayed his creations to advantage, and perhaps most importantly-francs to pay his bills. Charles Frederick Worth was officially succeeded on his death by his sons Jean-Philippe and Gaston, who had established important roles within the House in the 1870s. 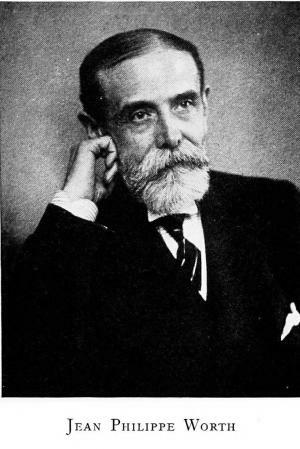 Jean-Philippe (1856-1926) worked as a designer alongside his father, and Gaston (1853-1924) functioned as business manager. Throughout the years and over the span of four generations, the Worths never lost sight of the need for astute financial as well as artistic direction. During the period when Charles and Jean-Philippe worked together as designers within the House it is impossible to separate their designs. Even though later house labels carry the signature of the elder Worth, others may have been responsible for the garment's inspiration. World War I and the subsequent devaluations of European currencies were particularly devastating to the Worths, because the house had dressed so many female members of the royal families of Europe. In addition, many of the House's older clients died during this period, while fashions were making the transition from Edwardian modes to jazz age styles. When Jean-Philippe and Gaston retired in the early 1920s, they were succeeded by Gaston's sons; Jean-Charles Worth became the new designer, and his brother Jacques the financial director. Jean-Charles easily moved the House's designs from the more staid yet elaborate models of the prewar period into the simpler and more practical styles of the 1920s. In the process, however, fewer and fewer of the characteristics that had been exclusively associated with the House's production can be discerned in the garments that survive from this period. Worth's grandsons were followed in the 1930s by his great-grandsons Maurice and Roger, the latter assuming the couturier role. They attempted to breathe new life into the House; in 1936 they moved the Paris store to 120, rue du Faubourg St.-Honoré. At the end of World War II, however, both the London and Paris branches of the house merged with Worth's old rival Paquin. The London branches, the first established in 1911, survived the Paris branch by eight years. Worth's heirs also shut-tered the branches of the House that had been established in Cannes and Biarritz. As of the early 2000s, the Worth name survived in perfume, although the company has long been out of direct family control. See also Crinoline; Fancy Dress; Fashion Marketing and Merchandising; Haute Couture; Jeanne Paquin; Paris Fashion; Perfume; Royal and Aristocratic Dress. Coleman, Elizabeth A. The Opulent Era: Fashions of Worth, Doucet and Pingat. New York: The Brooklyn Museum in association with Thames and Hudson, 1989. De Marly, Diana. Worth: Father of Haute Couture. 2nd ed. New York: Holms and Meier, 1990. Saunders, Edith. The Age of Worth. London and New York: Longmans, Green, 1954. Charles Frederick Worth Organization. Previously available from http://www.charlesfrederickworth.org . House of Worth. Previously available from http://www.houseofworth.co.uk .